SLHG – Margaret Beaufort – Saint or Schemer? 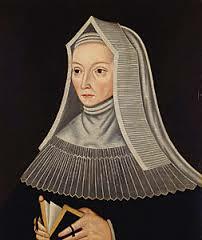 Margaret Beaufort – Saint or Schemer? The talk gave a detailed description of her family history and put it all into the political context of the time. At times you thought she was a victim and had her lifepath chosen for her but on many more occassions you felt as if she was manipulating those around her for her own and her son’s benefit. She was married three times and widowed three times! She had been a mother and widow by the time she was 13! The other unforgetable attribute was her ability to switch allegiances even when one of her husbands was still under oath to the King. This all happened at a time when two Kings, Henry VI and Edward IV, were both forced to have split reigns as they gained , lost then regained power.